We all know the 5 shoes any respectable woman should have in her wardrobe, Google alone has about 497 million suggestions on that. The black stiletto, black ballet pump and black ankle boot (am I sensing a theme here?) have been fed to us by all fashion channels of communication that we might even feel guilty if we didn’t own them. But what about the 5 shoes we definitely don’t need but desperately want? What about those extravagant, slightly out there pairs you know you won’t wear every day, maybe not even every month, but you just want to have? In the context of the French 5-item wardrobe these would definitely be a faux pas but that is the whole point. These are the kind of shoes you wouldn’t have to imagine with your entire wardrobe to justify the purchase because they are just meant to be fun. At the end of the day, fashion as a whole is based on wants, not needs, and there is no point in trying to make it look like it’s the other way round, no matter how hard we try. So let’s start with a classic – the brogue. With its origins as an outdoor, walking shoe, it would now add a certain preppy elegance to any outfit. But a classic brogue would not catch your attention in a store and make you stop in your way. 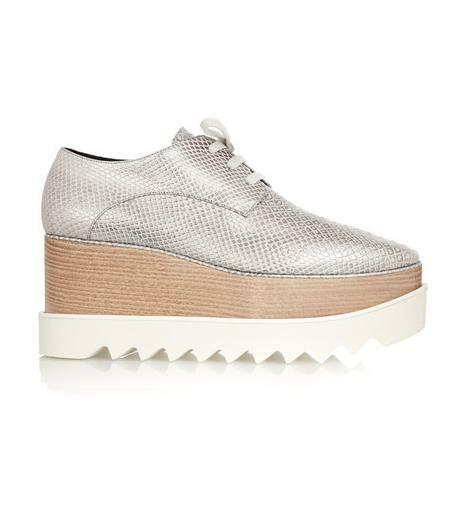 However, nothing says ‘this was an impulse purchase’ better than metallic flatform brogues. A perfect choice for the more casual of us, they add the right height whilst still being comfortable. Plus, they might make you look like a duck but they will also make you look edgy and that is all that matters. My favourite ones are these Stella McCartney ones, but take your pick! Just move the arrows to see the rest. 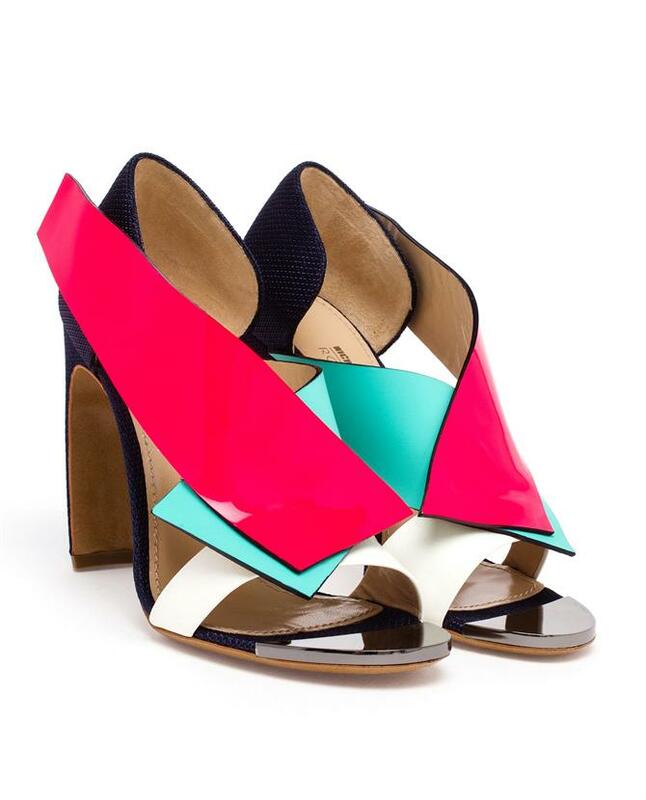 Who said the heel needs to be an integral part of your shoe? If you like a conventional shoe but want to add some spice to it you could try going for one with a decorative heel. This is the shoe equivalent of a mullet – business in the front, party at the back – and it’s the perfect example of one you clearly do not need it in your wardrobe. If dagger shoes are worthy of a Bond film, a lipstick-heeled shoe might just be the perfect gadget for a woman. However, if you’re going for the more abstract, then you should find something amongst these other options. If I were to have a dream shoe right now it would be the emerald green variety of these Altuzzara over the knee velvet boots. Sadly, my attraction to velvet at the moment seems to not be the result of my creativity and fashion forwardness but of successful advertising, because it seems to be everywhere this season. Velvet could make you look like you’ve just stepped out of a Downton Abbey episode, but put it on your feet and it becomes just the right kind of quirky. If you don’t feel like spending a month’s rent on shoes, I would suggest going for the Topshop or Zara variety – from monk shoes to high-heeled booties. However, if you want to splurge, go for these Gianvito Rossi heels or, even better, put on my favourite Altuzzara’s and make my dream come true. Extravagance doesn’t always come under an explicit design, so sometimes the simplest way might be to just go for colours – colours that are bold and loud and make statement. Just like these ones – so far away from basic that they would definitely be a conversation starter. Unless they lived in a very cold climate, most people would not classify fur as a necessity, especially not on the outside of their shoes and especially not on the outside of their sandals. But if you like fur, what would be better than sandals to combine it with warm weather? Feathers are, safe to say, useless on any garment, not to mention shoes. Therefore, they make for the perfect candidate for this article. I remember seeing the Topshop ‘Rizo’ sandals last year around Christmas but decided against buying them because of the price. In hindsight, that was a sensible decision but I still regret not having them in my wardrobe. 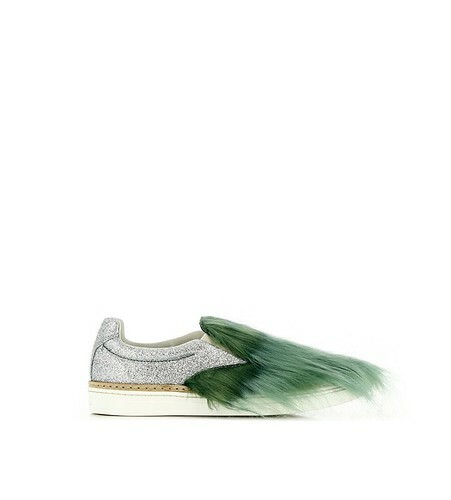 And that is why, if the occasion arises, I would suggest adding a furry/feathery shoe friend to your wardrobe because you might never wear it, but you know that it will be worth it if you do. So take your pick, here are some suggestions. These are my ultimate suggestions for the 5 shoes you do not need in your wardrobe. But I suggest you go and pick them up once you’re done with your buying the 5 shoes you definitely do need. And then, when you have these, keep going and add your own. And let me know what those are so I can go buy them myself. It’s time we added some bling to our footwear. I love your selection. The Stella shoes had caught my attention months ago, and those new transparent heels we see at Dior are so cool ! OMG yesss I loved this post! You made a great selection of interesting shoes that I definitelyyy want simply because of their uniqueness! Who are those Abstract Colour Shoes by?